OAKLAND, California (6/19-15) – On this date, it can truly be said: "This is the day which the Lord hath made; we will rejoice and be glad in it." Psalm 118:24. For Oakland, California, this day heralded what could be the great turning point for the perception of a city that has received constant negative press. Today the city hosted a parade and ceremony to celebrate the World Championship of The Warriors basketball team, an event that was televised throughout the world giving everyone a peak into that part of The Bay Area. A million people thronged to the city to celebrate the Warriors' World Championship win, lining the parade route, then gathering in front of Kaiser Convention Center to hear the players and coaches speak. It was a truly festive event and peaceful one. There were no chaotic outbursts or protests. Indeed, the people all seemed to enjoy each other while squeezed together for this event. . Oakland was seen at its best on this beautiful day. The speakers at the event including the players were not arrogant, nor did they utter any vulgar language or slang. They behaved in a totally professional manner and conducted themselves with class. They were gentlemen. Harrison Barnes showed wonderful humility as he spoke, Andre Iquodala was fun, Clay Thompson was both humble and fun, Draymond Green stated, "I am blessed." 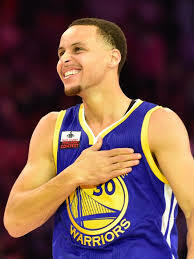 Stephen Curry was his usual self and when he took his place on the platform with the other players and staff members; he had with him, his little daughter Riley who sat in his lap during the ceremony. Family to Steph is more important than anything in his life. What a positive example he sets. One speaker noted how Curry was so good with the press, answering their questions while always being gracious. The entire team never showed anger during the series. They were good sports. What is the secret to The Warriors superior playing and image? First of all, Steve Kerr, the coach demands that they take care of themselves, live clean lives, exhibit proper conduct at all times, be a good example in public and take part in community projects. And there is a peace about each of them, whether on court or out in public, which is noticed. Here is the major secret of how they receive such love from the public and play with such precision on the courts and have such success with their families: They have a Spiritual base. The team has a chaplain who is available to them at all times to provide Spiritual guidance, encourage them in the proper handling of their personal lives and a regard for God. Before each game, the chaplain prays with them. SHHHHHH! Hold it: Perhaps I should keep this quiet, otherwise the ACLU, and Obama may come charging into the locker rooms and yell, STOP IT!!! Their behavior has been noticed wherever they go, and they have now changed the perception of Oakland which in itself is a major accomplishment. Now if the citizens of this Bay City will consider carefully and act accordingly, this could forever cancel out the negative impressions the world has. I could see this happening. So could Scott Haggerty,of the Alameda County Board of Supervisors, one of the first to speak, who said this: "Today could signal the re-birth of Oakland." Yes it can, if, the people there will hang on to the ball. Today the city of Oakland was presented at its very best to the world, and to the citizens themselves. That momentum must be continued. It is up to you Oakland. Here's hoping.